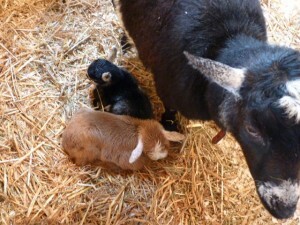 On May 26, 2011 we had our first goat kids born here. My Nigerian Dwarf Cissy gave birth to twins. We were expecting a single, but we got twin girls! Although I was pretty sure she was going to give birth that night, she went into labor so quickly and gave birth to the first kid, Grace, so fast, that she was out before I could even run to the goat house. All of my plans for good photos and video with great lighting were all ended by a fast and easy birth. While fascinating to watch the birth of baby goats, the video quality isn’t great. The most entertaining part to me is listening to the things my kids say and the questions they ask. Tragically, as Cissy’s night progressed she was clearly becoming more ill, and by the next evening I had to rush her off to the vets where they valiantly tried to save her for the next two days. Cissy died from toxemia less than 3 days after giving birth to the babies, and had only spent a few hours with her beautiful babies. She was a great mother and we were all heartbroken by her loss. I raised Grace and Kiki on bottles from the time they were 12 hours old. They probably don’t remember Cissy, and think of me as their mother.